The “Official” 2018 AREC Marathon and Half Marathon training program will begin on Saturday, May 12, 2018! We at AREC are committed to providing you with a detailed training program complete with on course aid stations as necessary and occasional guest speakers, in addition to experienced leadership and advice, motivation, mental preparation and all of the tools necessary to accomplish this courageous goal. And we will have a great time doing it! Our “Official” training program is geared to coincide with the Long Beach Marathon events on October 07, 2018. Training runs take place on Saturday mornings at 7:00 am and start/finish at the formerly Joe’s Crab Shack parking lot (6550 N. Marina Dr.). Please arrive early each week to sign in, warm up, stretch, use the restroom and mingle first. Distances begin shorter and get progressively longer. In the weeks (and months) leading up to the training, it is recommended to slowly build up your weekly base mileage in preparation. Our Wednesday runs are a perfect opportunity to help build this base. The training is included with annual club membership, so sign up today! Arrive early and please be patient the first 2 weeks of the training as we get everyone registered prior to the runs of 3.4 and 5.0-mile distances. Immediately following the runs each of these weeks, there will be an informative talk about the club, the coach, and the training, along with Wrigley River Run 5k/10k race entry giveaways, so plan to hang out for that. To view maps of the courses from the first 2 weeks of training, click here. For more information about this program, contact AREC Marathon Training Coordinators and Road Runners Club of America (RRCA) certified coaches Chris Matuszak (chris.matuszak@gmail.com) or Kelly Motyka (kmotyka@mac.com). To volunteer to “man” a water station during the training, contact Danille Linden at danielle.linden@gmail.com and she will let you know what dates/times/locations are available. Thank you! 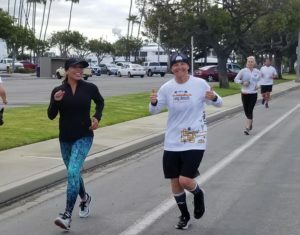 Once our “Official” marathon and half marathon training concludes, we have an “Unofficial” marathon and half marathon training program that continues to train for the Surf City Marathon in February and the Orange County Marathon in May. A group will meet every Saturday morning at 7:00 am from the same Joe’s Crab Shack parking lot. The member in charge of the unofficial program will send out a weekly e-mail with course directions for the upcoming run along with a map link. However, no water/aid stations or guest speakers will be provided. It is also assumed that runners in this program already have a good training base as the schedule is compressed to 13 weeks between events as opposed to the 21-week schedule for the official program.